This weekend, TLC's newest reality show will debut, featuring ex-Alaska governor Sarah Palin exploring – where else? – her beloved home state. Palin may be one of the most polarizing figures in recent political history, but whether you love the gun-slingin' maverick or love to hate her, it's hard to argue with a passion for such an adventure-packed, breathtaking wilderness as the Last Frontier. Now through the next few weeks is an ideal time to visit – summer tourists are long gone, and winter has yet to get into full frigid swing. Plus, rates tend to be lower on everything from accommodations to transit (the Alaska Marine Highway System, the state's extensive ferry, is offering big discounts; more info on that below.). Here, I've rounded up some cool offerings to explore this rugged outdoor paradise – Palin sightings not guaranteed (but please do let me know if you can see Russia from your hotel). A new Northern Lights expedition: The Northern Lights is a spectacular natural phenomenon that draws hundreds of skygazing adventurers every year, and with a new offering from two outfitters, now you can add another quintessential Alaskan activity – snowmobiling – to the mix. Alaska Backcountry Adventure Tours and Alaska Snow Safaris have announced the Northern Lights Expedition, a multi-day snowmobile tour that takes travelers miles into the lake country of the stunning Mat-Su Valley (pictured at left). You'll bunk up at a cozy lodge on the Yentna River, which is in prime positioning for Northern Lights viewing. You can also add ice fishing to the mix. For more information, visit www.youralaskavacation.com. Anchors Away: The state-run ferry system, called the Alaska Maritime Highway (www.ferryalaska.com), provides a great way to get up close to glaciers, wildlife and tiny Alaskan towns, and it's affectionately known as the poor man's cruise. Indeed, accommodations are sparse and there are no round-the-clock buffets, but the authentic experience you'll get – especially if you take off-the-beaten path ferries that service local towns – is unmatched. Plus, there are some great discounts offered through the spring: 30 percent off round-trip routes for full-fare adults, children and vehicles, and a free driver fare for accompanying vehicles (discounts can be used together; www.travelalaska also has updates and info on the ferry and other travel resources). A few tips for first-time ferry travelers: 1) To save extra money on cabins, many adventuresome types camp out in their tents on the ships' solarium decks; space goes fast, go grab it quick; 2) In the winter, service drops off, so be sure to confirm your itinerary ahead of time; 3) Longer voyages can be bumpy, so make sure you pack the Dramamine. Win a free trip to a funky festival: Fur Rendezvous is a 10-day celebration of Alaska's trading and trapping heritage, and this year organizers are offering a free trip for four to Anchorage for the festival, which runs from February 25-March 7, 2011, in Anchorage. To register, visit www.alaskamagazine.com and sign up (I did it myself; the usual address and email entries are all that's required, though the site can be slow to load). You can register once daily to increase your chances of winning. Free trip or not, the festival, commonly called the Fur Rondy (www.furrondy.net), sounds like a blast. Events include the World Championship Sled Dog Races, Frostbite Footrace, and the Running of the Reindeer. 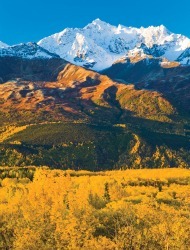 For general trip-planning information, see our Alaska Travel Guide, and find great offers on cruises and more with our Alaska Travel Deals.